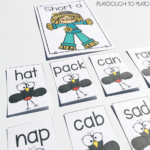 Are you looking for a fun way for kids to practice reading and spelling CVC words?! 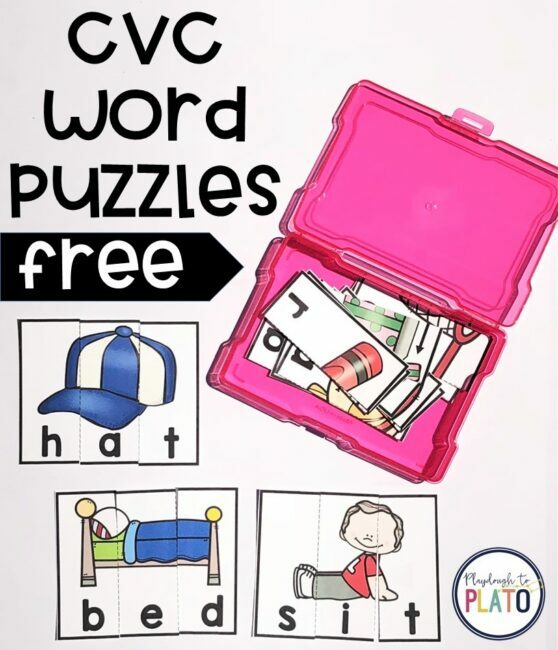 These free word puzzles are easy to prep and your students will love the fun and bright pictures. 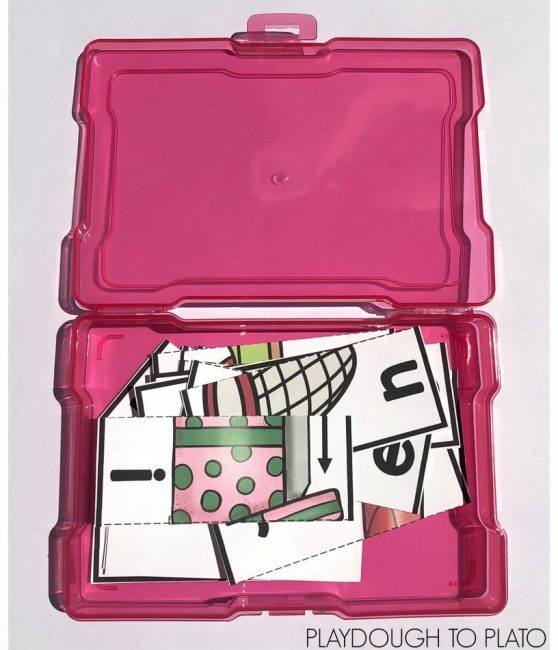 Scroll below to grab your free puzzles and then make sure to jump over and grab our unicorn sight word game for even more reading fun. Prepping this activity was a snap! I printed the puzzles on white cardstock and then I ran all of the cards through the laminator to ensure durability. Next, I cut along the dotted lines to separate the pieces. I placed the pieces in a 4 x 6 photo box for easy storage. 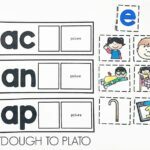 Finally, I printed out a recording sheet for each child so students would be able to write the CVC words after they put the puzzles together. The activity was great to use with a small group of students! 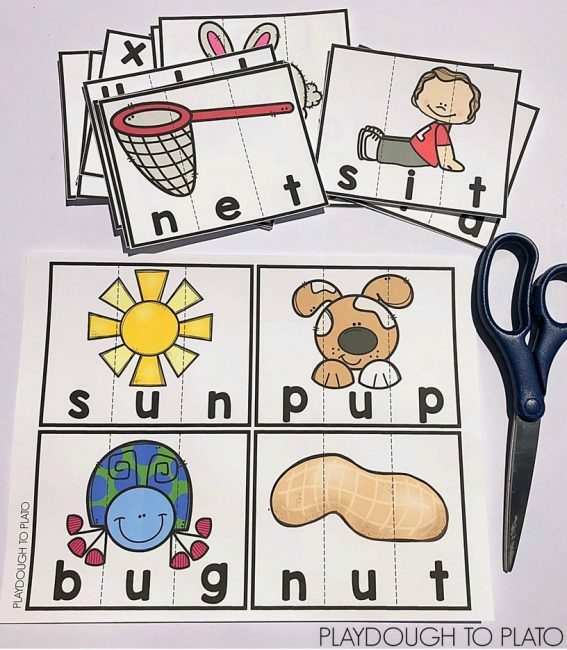 To start, we reviewed the short vowel sounds together and I asked the children to give me a few examples of CVC words for each vowel. Our short A list included cat, man, lap and rat. 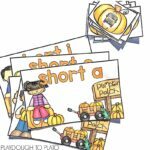 I spread out the puzzle pieces on the table – making sure to place the three pieces in each puzzle in a pile so children could find a set quickly. Then I asked a volunteer to pick one of the puzzles, solve it and read the word out loud. 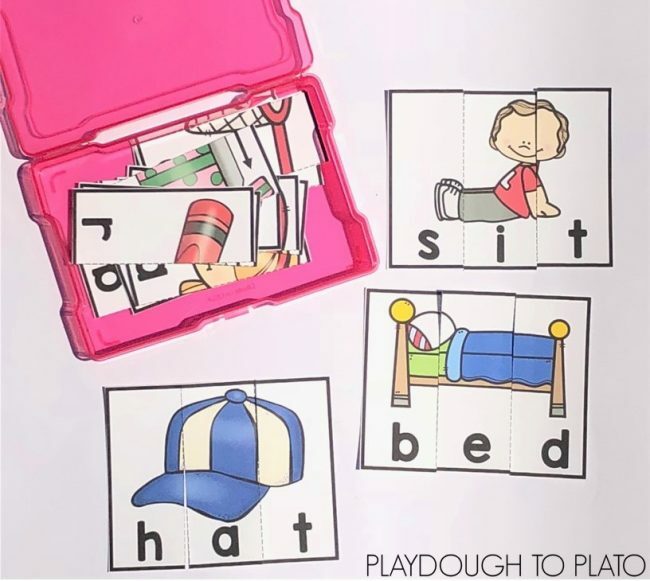 She chose the puzzle for the word “sit.” As she spelled the word she used her finger to point to each letter. We worked through one more example as a group before I sent students off to solve the remaining puzzles with a partner. When all of the puzzles had been put together, I gave each student a recording sheet. The children wrote each CVC word next to the correct picture by writing one letter in each box. If a student had trouble spelling a word, I had them go back to the puzzle and sound out the word again. It was an awesome way to check for understanding! Ready to practice some CVC words? Scroll below and click on the blue download button to snag your freebie. 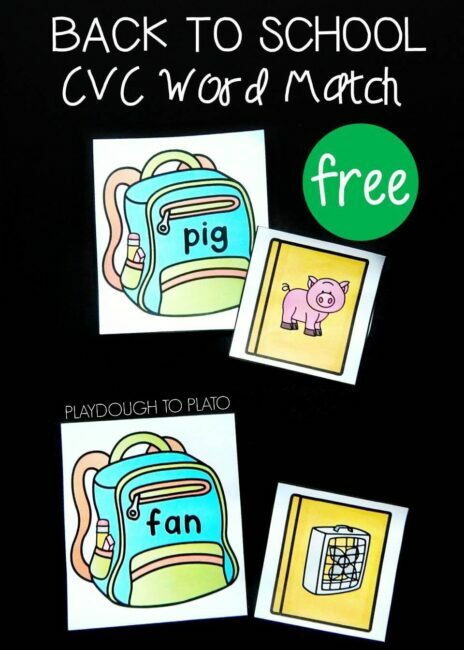 Then hop over and grab some Back to School CVC Word Match for even more reading fun! Is there any chance you can email this to me directly? I can’t get the form to submit. I have not been able to download any materials despite following your troubleshooting info. I have tried 5 or 6 times, each unsuccessful. I’m so sorry it’s been giving you problems. 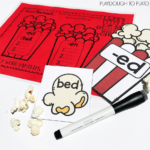 Email me at hello@playdoughtoplato.com for further assistance. Thank you, these look great! My students will love them. So glad you like them! I hope your students do too! I’m so sorry the link is giving you problems. Please email me at hello@playdoughtoplato.com for further assistance. How do I get the CVC puzzle game and printable? I am highly interested. All you need to do is scroll to the bottom of the CVC Word Puzzle Post. Then, click on the blue “Download Now” button. A screen will pop up, asking for your name and email. Once you submit the information, the freebie will appear.